You mean they don't already have cell phones? :-) Just kidding. I am amazed at the ages some kids have phones. No, I dont think they will be embarrassed by anything you do. Those are gorgeous sweaters! What a treasure to have ones that their great-grandmother made. Very nice sweaters, my mom used to knit a lot. I wore some ragged mittens yesterday she had made decades ago, she used to draw your hand for the pattern. I text my youngest in HS but he won't tolerate any gushy mom-like stuff. It's all business, usually about his diabetes. Hum, guess I can text my granddaughters next! 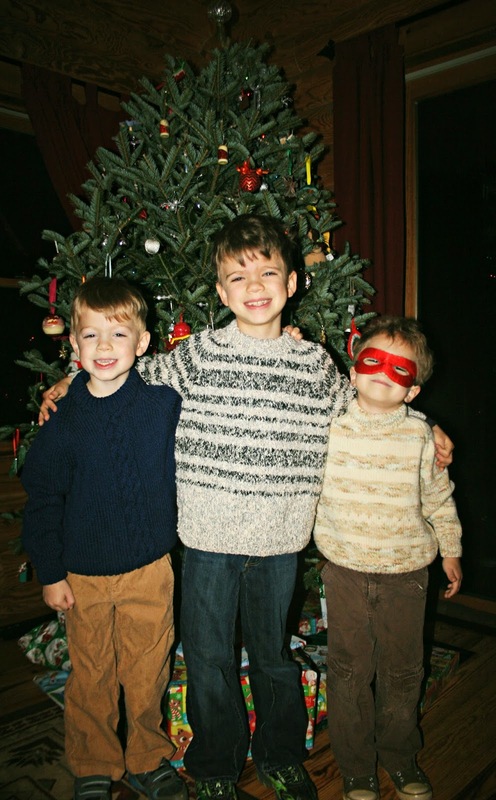 Cute sweaters and gorgeous sons.. They are growing up MUCH too fast. He's a superhero! Great sweaters and neat text idea too! Fun picture. Cort is so cute! And the lovingly knitted sweaters are a perfect fit. Have they started asking for cells yet? Are you planning on holding off till high school? Middle school? Hey, we went to Kroger last night and found BOTH the teas!! I will be trying the chocolate in a few minutes with lunch, and we will have the other tonight with dinner! First of all those are lovely knitted sweaters. I do not believe they will be embarrassed by your text messages. They may go through a phase but that will pass. We gave our kids phones in middle school out of necessity. And it wasn't because they were in middle school...it's because the darn school will not let them use the phone to call and there are no pay phones anymore. You'll know when you need to get them phones. It becomes a necessary thing at some point. We just limited the texting --but that was back in the day. Now all plans have unlimited texting. You'll surprise yourself on how you sort of know the limit to how much you will contact them during the day. I've got friends who constantly talk to their kids. Me, not so much. But when something is going on or we need each other, the fingers are flying! You are blessed that they have a great grandma. They are too. I know they will be embarrassed to get a million emails from mom or grandma! Oh man! This touches my heart. I often think of the future and if they'll be embarrassed by my hijinks. I hope not. Sometimes I wish they'd just stay little. Those are nice sweaters. My grandma used to knit. I remember when she made my sister, and boy cousins all sweaters one year. They were adorable. It's funny that Cort has to be the different one. :) Reid and Pierce look so much like twins in the face. If it wasn't for their size difference I'd think that was the case. I never thought about cell phones. I'm not a big texter - if that's even a word. It was odd when the boys were little I called my parents or husband to check up on them. When they went to school I couldn't do that anymore. Nice sweaters! And what I've seen of your boys on your blog, they'll love getting texts from you!! lol. I'm going to be texting mine like crazy one day! My dad keeps asking Livie, "Do you have a cell phone, yet?! Tell your mom you need one!" I bet they will love the texts from Mom.... but... as fast as things are changing, are we going to still have texting? Hi Lisa, I really love this post! Their sweaters are very lovely too. My grandchildren hang up on me when they hear me, grandmom's voice. God bless you, Lisa, family, loved ones. Warm Hugs from Starry.